If there’s one thing I love in the fall its chunky scarves. I love big, warm scarves because I love to feel all wrapped up and cozy. This new crochet pattern for a Scarf with Sleeves using Red Heart’s Hygge yarn is simply perfection. This scarf is long. It is wide. It is plush, and cozy, and warm. THIS SCARF HAS SLEEVES!! It is also my new favorite piece of clothing. 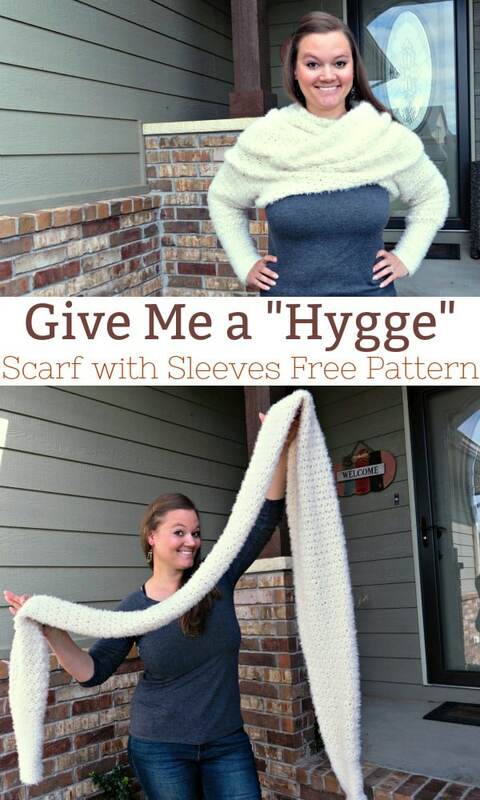 ♥ I decided to name it the “Give Me a Hygge” scarf because of the way you pronounce the yarn: Hoo-gah. Give me a HOO-GAH! Do you watch the weekly LIVE videos on the Heart Hook Home Facebook page? If you don’t, you should watch the video where I modeled – or tried to model! LOL! – this new pattern last week. It. Was. Hilarious. I promise that by this week’s live video time (always at 7:00 pm CST and always on Thursdays) I will have mastered the art of wearing this beautiful scarf. 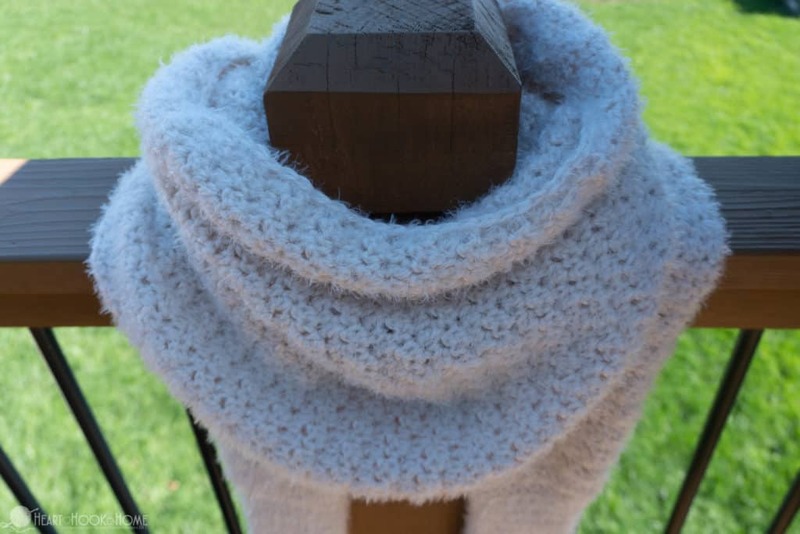 To wear this scarf you can wrap it around the back of your body OR the front, then insert your arms into the sleeves and settle the scarf into place around your shoulders. Play around with how you want to wear it. 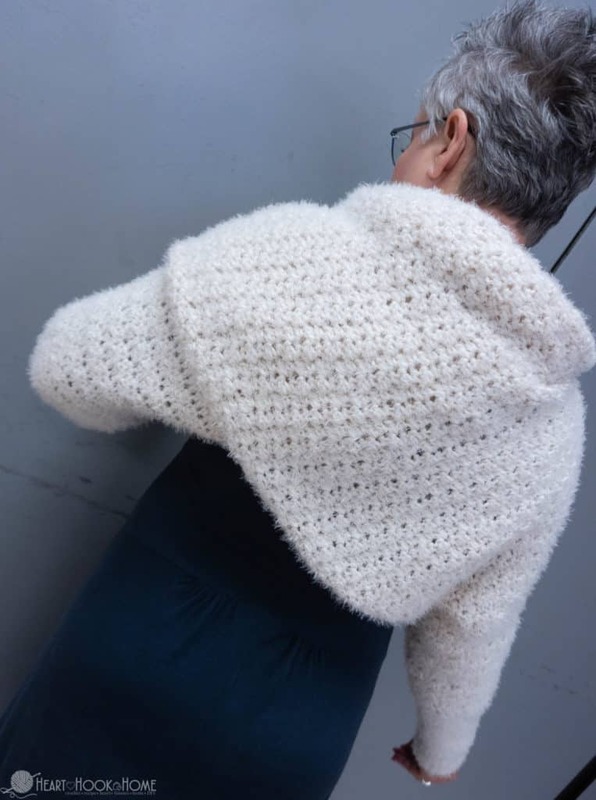 This pattern uses the Lemon Peel stitch, a remarkably mindless and repetitive stitch that works up super quickly with this bulky weight yarn. 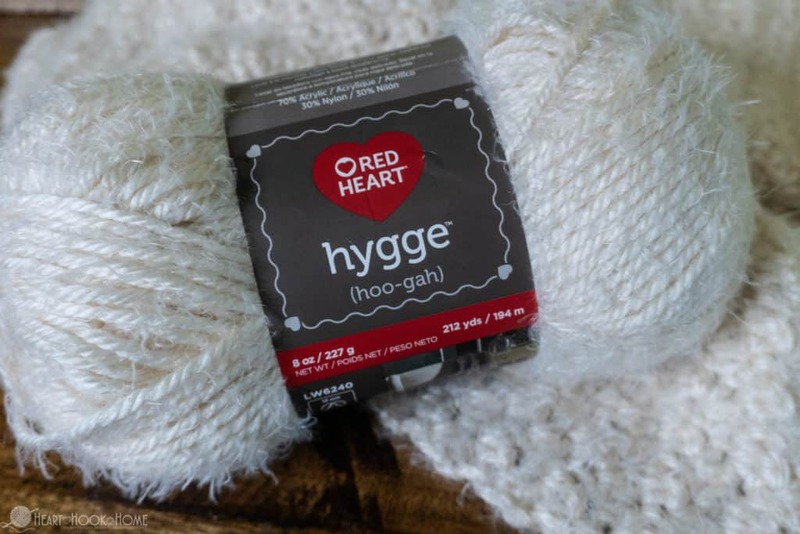 I love the bulky size of this Red Heart Hygge yarn, the texture is to die for, and the feel of the fabric when worked up? FABULOUS!! 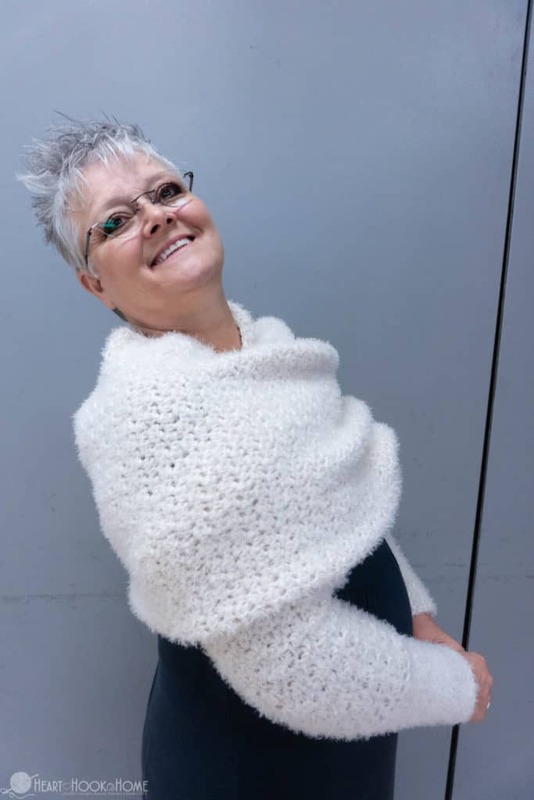 I asked my Mom to model the scarf after my step-sister’s baby shower this weekend, and she is just as beautiful as ever! ♥ Thank you, Mom! Place first st of each row in same as turning. 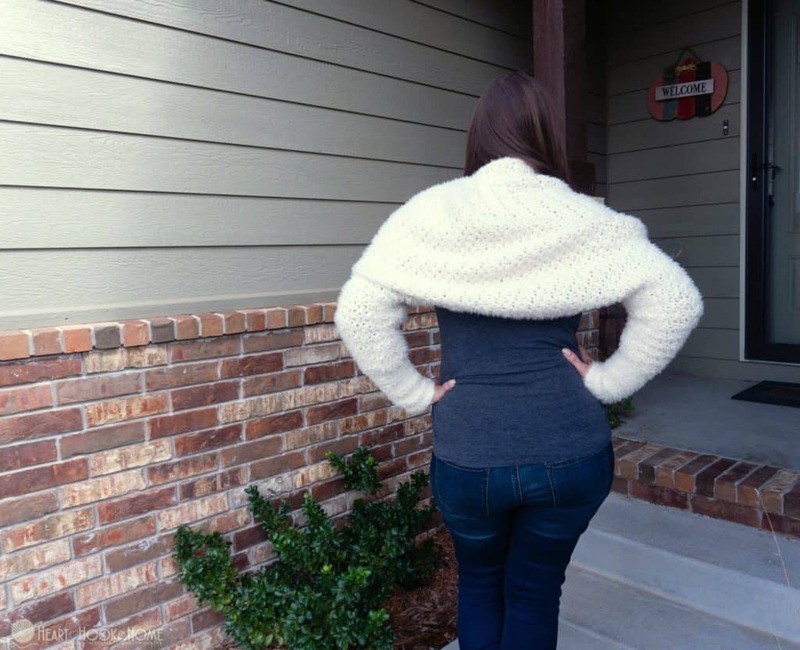 The Plus Size of the pattern has been added below! Get the ad-free printable version of this pattern here. Thank you! Lay out the sleeve (one at a time) so that the fabric naturally gets wider, like a sleeve would. Measure up from the first row of the cuff until you reach 10″ high. You want the width at the “top” of the sleeve to be about 7” across. Use a stitch marker to mark the place where the pieces intersect and to keep two pieces from separating as you sew. 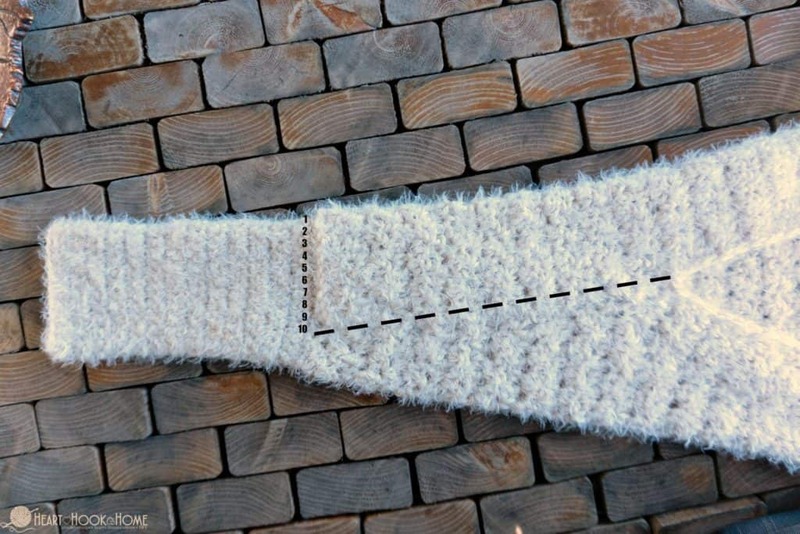 Using your remaining yarn, sew from the cuff up those 10” on the sleeve. Flip the sleeve inside out and sew that inside flap closed as well. Weave in all ends. Do the same to the other side. Lay out the sleeve (one at a time) so that the fabric naturally gets wider, like a sleeve would. Measure up from the first row of the cuff until you reach 10″ high. You want the width at the “top” of the sleeve to be about 9” across. Use a stitch marker to mark the place where the pieces intersect and to keep two pieces from separating as you sew. Attach yarn in the corner of the sleeve opening (where the underarm will be) and sc in each row end allll the way to the other end, then up the other side. Join to first sc and weave in all ends. That is it! Isn’t this easier than it looks?! Now all we need to do is to practice wearing it! Ha! I hope you love this pattern! 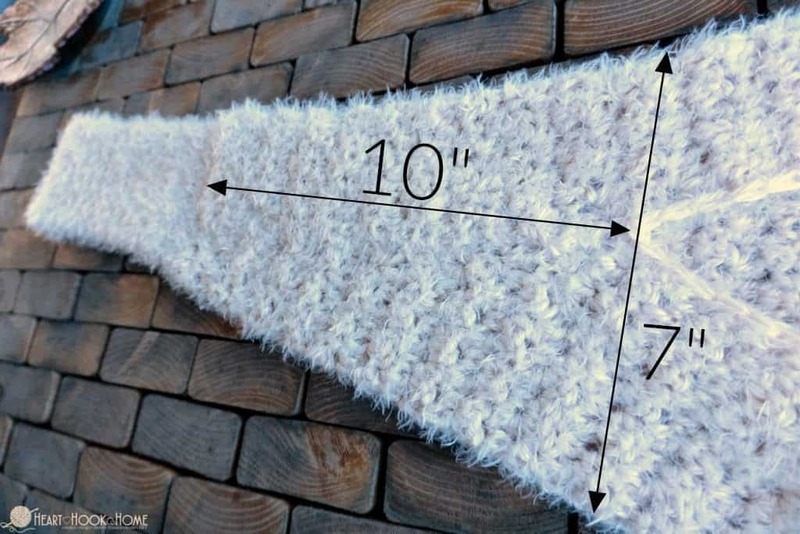 I am trying to figure out if I can make a knit one of these. I have never been able to get the hang of crochet. Hello! I love this pattern. I’m to to crazy about the lemon peel stitch. Do you think this would be ok to just do a double crochet? Or maybe would a half-double be better? Hi Natalie! I would go with half double. Happy crocheting! Question, would this be good in bernat blanket? What's the final measurements of the plus size one? I finally finished this and it's lovely. I cannot figure out how to wrap it so it crosses in front like in your photos. Can you direct me to a video of how to dot that for real? I saw the video where you played w it over and over and never quite got it right. It was funny watching the video. But now it is just frustrating! I made this for a gift and would really like to show her how to wear it as well. Thank you! Show me. I just finished one and don't know how to wrap it. What part of the body does the beginning chain hit?? I'm trying to decide between plus and regular size. Thank you! 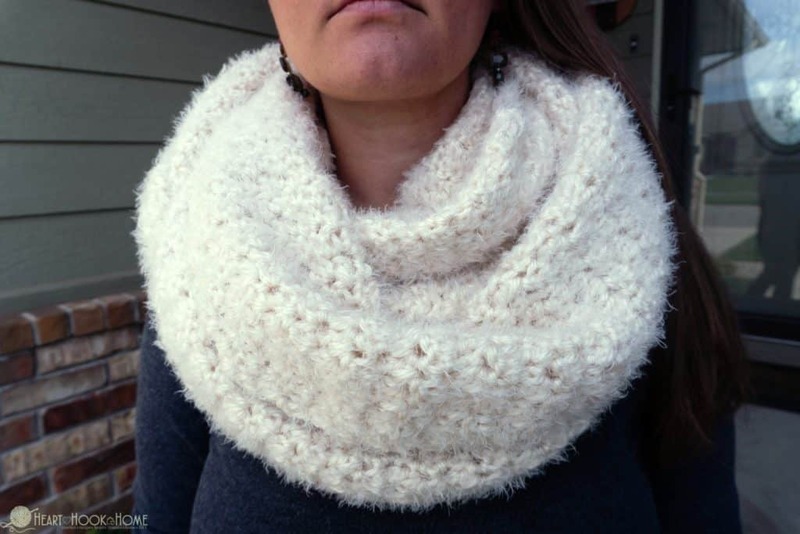 I just fell in love with this Hygge sleeved scarf ! I However, I would very much like to know when the plus size version will be online ! Love from Belgium and thank you for yet another beautiful pattern ! Hi Nadia! It will be posted today!!! Thank you so much ! I missed your quick reply ! I mainly saved this post because your mom looks so much like one of my aunts. So much so I had to do a few double takes!!! 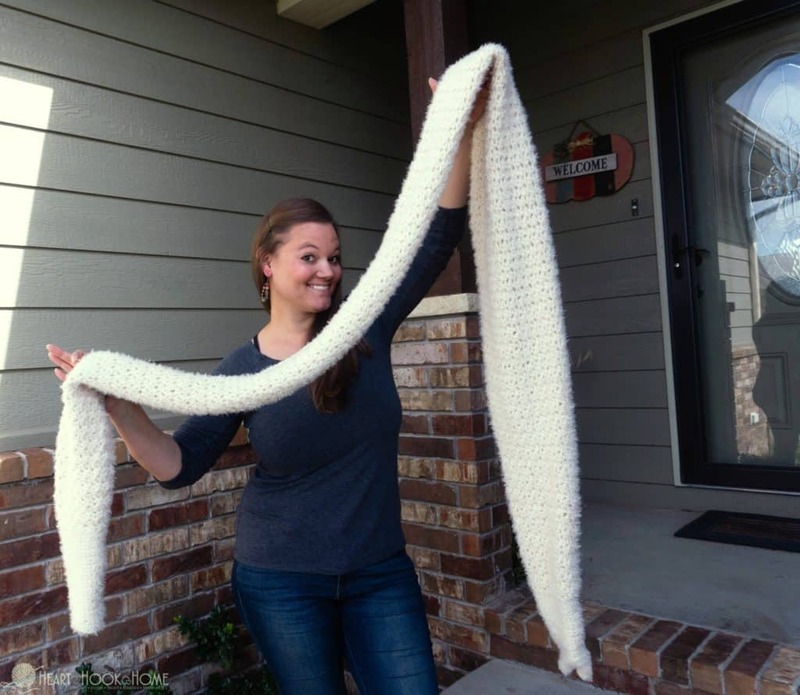 I'm also excited to make this scarf. Is there an ETA for the Plus Size edits? Got my yarn, just need the pattern update! I'm really excited to try this. I think it will make an awesome nursing cover! Thanks! I can't wait for the plus size pattern, this is lovely! Hi Kristine! I used 4 of the 8 oz. skeins to make this. Hope this helps! Love the looks but I don't get how to finish the sleeves at the end. I am new at this but love it. Could you do a tutorial on this. Thanks for any help u can give me. I love this and can't wait to make it, I'd also like to know when you have the plus size pattern please. Hi Brenda! I would say it would go up to about a size 14/16. I will have an XL version out soon if that will work better for you. Hope this helps! I love this scarf! Is there any way I can be notified when the plus size pattern is published? In your photo it doesn't cover your bossom but on your mom it did....I want it to cover mine. Will it? Hey Jeannie, with the way it is constructed, I think you could get several different looks with this. Just depends on how you wrap it. I can't wait to make one! Hi Jeannie! It's all a matter of where you tuck and where you pull...lol. But it will cover the chest area if you pull it down a bit in the front. Hope this helps! 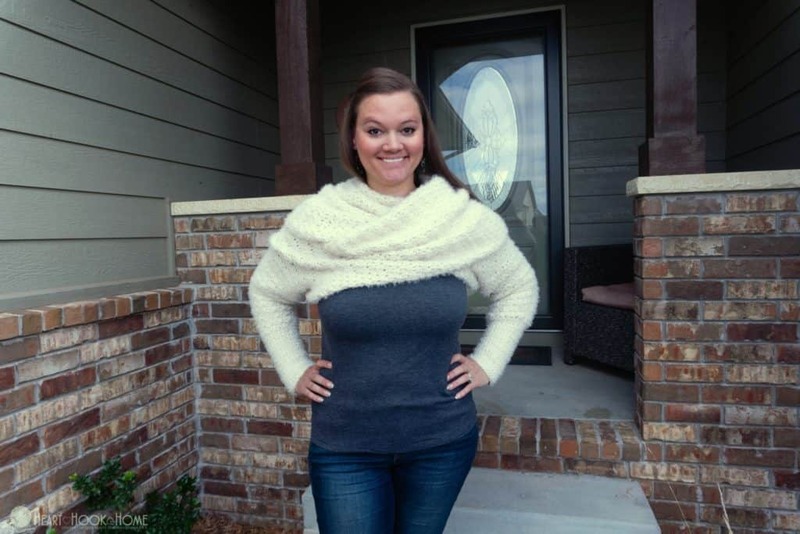 When I saw the first picture of you wearing it, I thought you had added sleeves to an infinity scarf. This would be easier I think.